Crafted by immortal hands the cauldron comes, the cauldron stirs. Reflected in our Earthly lands a place for healing and rebirth. 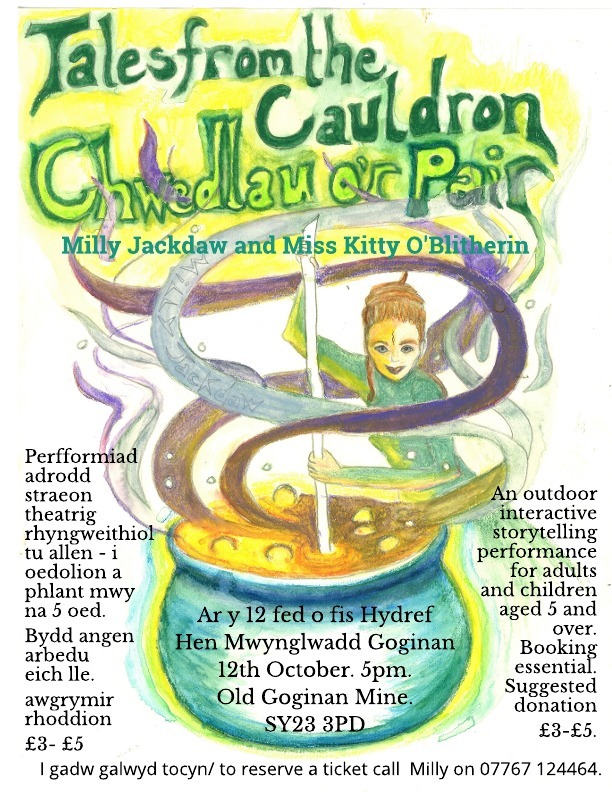 You are invited to a theatrical, storytelling journey on the trail of the secrets of the cauldron. Follow Kitty and Milly into the wild woods and find your place at the wise woman's fireside for the most nourishing of feasts: a feast of tales. Drawing on Welsh myths and incorporating songs, sounds and puppetry we have wrought these tellings within our own pot of imaginings; crafting from found materials and giving bodies and voices to the characters in the tales. This performance is suitable for adults and children over 5 years old and is an outdoor, interactive experience. There will be fire, there will be refreshments, there will be cover and there will be a short walk so wear suitable clothing. Please contact us directly to reserve a ticket as numbers are limited. We aim to arrange lift sharing to minimise vehicles to the site.